By combining their expertise and competencies in the field of display metrology, a novel imaging colorimeter for fast and precise luminance and color measurements of flat panel displays was developed by Konica Minolta and Instrument Systems. The LumiCol 1900 is a 2-in-1 device, combining an RGB CMOS sensor for fast 2D image acquisition with a spot colorimeter for precise tristimulus color measurements. The colorimeter measurement, performed in a spot in the center of the acquired image, is used to correct the values derived from the CMOS camera, guaranteeing colorimeter precision across the 2D image. As a result, the LumiCol 1900 enables a fast, but still precise characterization of the whole display area in one shot, making it ideal for automated production and quality control. The spatially resolved measurements of the LumiCol 1900 allow the calculation of homogeneity or the evaluation of Mura. Additionally, the incorporated CA-310 provides the typical functionalities of a conventional colorimeter and display color analyzer such as measurement of luminance, white balance, color gamut, color gamma, contrast ratio, or flicker. The comprehensive new Instrument Systems software “LumiSuite” comes with a completely new and user-friendly GUI for laboratory applications. Furthermore, a software development kit is available for easy implementation into any production line. 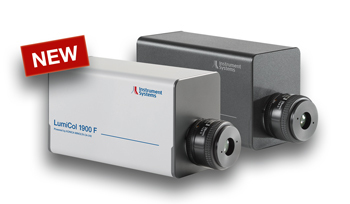 Two different versions of the LumiCol 1900 are available. Type “U” (universal) can be used for all display types. Model “F” (flicker) is designed for liquid crystal displays and includes measurement of flicker characteristics.